Urban IV, given name Jacques Pantaléon, Roman Catholic Pope from the 29th of August 1261 to the 2nd of October 1264, was the son of a shoemaker of Troyes. Having received a monastic education, he became archdeacon of Liége and papal legate of Pope Innocent IV to Poland and Prussia; he was consecrated bishop of Verdun in 1253, and two years later was translated to the patriarchate of Jerusalem. While on a trip to Italy to explain at court a quarrel with the Hospitallers he was elected to succeed Alexander IV, after a three months' vacancy in the Holy See. He never visited Rome, but lived most of his pontificate at Orvieto. He favoured his own countrymen, and under him began that preponderance of the French in the curia which later led to the papal residence at Avignon, and indirectly to the Great Schism. He endeavored without success to stir up Louis IX of France to undertake a new crusade. In 1264 he instituted the festival of Corpus Christi. His chief domestic problems arose out of the competing claims for the crown of the Two Sicilies. He favoured Charles of Anjou, and declared in June 1263 that the papal grant of the kingdom to Edmund, son of King Henry III of England, had expired because of the latter's inability to oust the usurper Manfred. 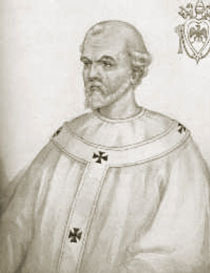 Urban died before the arrival of Charles of Anjou, and was succeeded by Pope Clement IV.